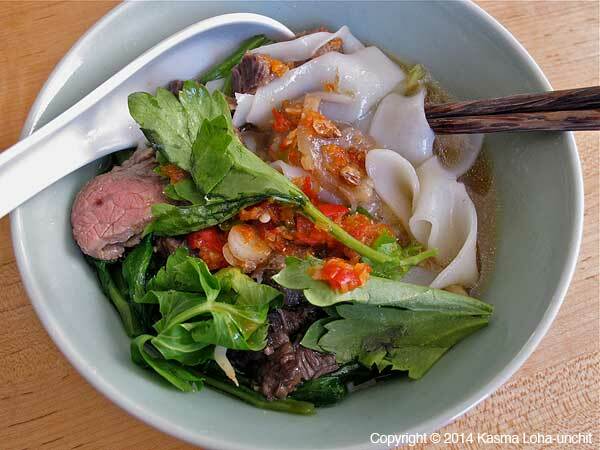 Stewed Beef Rice Noodles – "Boat Noodles"
Be sure to see Kasma's Blog on Beef Noodle Soup. Make the stewed beef and tendons by placing the whole beef shank with all the herbs, spices and flavor ingredients in a large stock pot. Add water and bring to a boil. Reduce heat and simmer over very low heat until the shank is tender. This may take 3 or more hours. 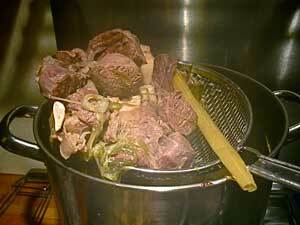 Remove the beef from the pot and strain out all the herbs and spices from the broth. 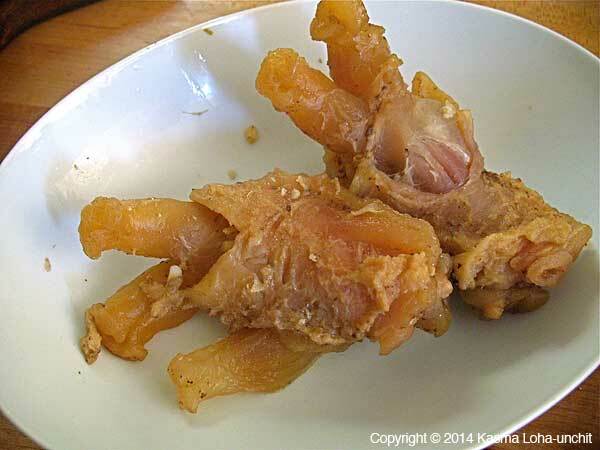 Cut shank including tendons into bite-size chunks and return to the strained broth. While the beef shank is stewing, prepare the hot sauce. Pound the chopped chillies and garlic to a paste. Then combine with the remaining sauce ingredients and let sit at least 1/2 hour to let the flavors blend and mingle. The sauce ages well and actually tastes better when made a day or two ahead of time. If you are using fresh chow fun noodles, separate as much as possible into single strands. Make the fried garlic oil and prepare the remaining ingredients where necessary. When the stewed beef and tendons are tender and you are ready to cook the noodles, bring a large pot of water to a boil. On an adjacent burner, keep the stewed beef and broth heated to a gentle boil and add the beef balls. Using a noodle cooking basket with handle or a wire-mesh strainer, blanch the noodles, bean sprouts and morning glory for a few seconds until the noodles are hot and vegetables wilted. (You can blanch them together or separately depending on whether you are cooking by the bowl or in a large batch at a time.) 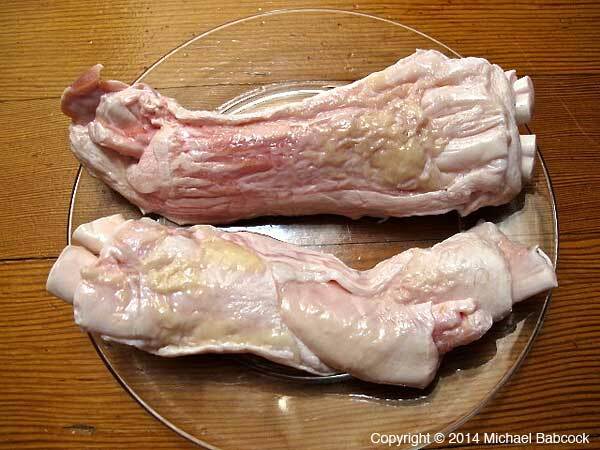 Remove from water, drain and place in individual serving bowls. Blanch the sliced beef steak in a wire-mesh strainer dipped into the hot water just enough to cook to medium rare (or cook in the boiling beef broth). Lift strainer out of water and drain. Arrange beef slices over the noodles and sprinkle with some green onion rounds. Then spoon a couple of beef meatballs and some stewed beef and tendon pieces along with broth over the noodles in each bowl. Dust lightly with powdered white pepper and top with fried garlic oil (both garlic pieces and a little oil), and Chinese celery or cilantro leaves. Serve hot with the chilli sauce on a condiment tray that also includes ground dried red chillies, sugar and fish sauce, at the table for adjusting flavors as each person wishes. Serves 10 as a one-dish meal. 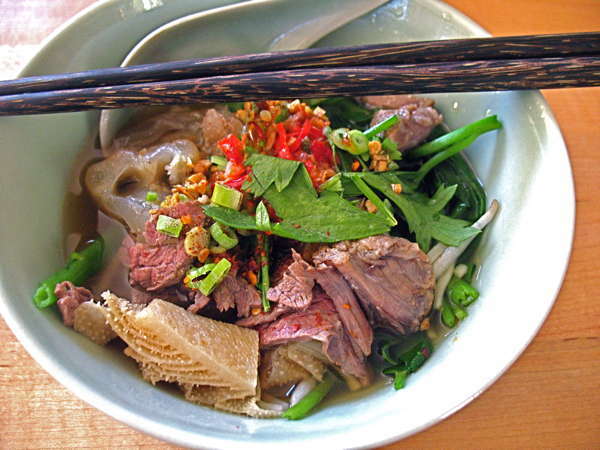 Each Southeast Asian culture has its favorite noodle dishes. The Vietnamese are fond of their pho, the Thai of their gkuay tiow reua ("boat noodles"), and the Malaysians their laksa. These noodle dishes share similar roots - they are Chinese in origin, introduced by immigrants from different parts of China who settled in the region several generations ago. Their descendants continue to run the noodle shops that abound in many Southeast Asian cities, or hawk countless bowls from push-cart stalls and paddle boats, adding color and aroma to the sidewalks and canals of the Orient. The common origin explains why many noodle dishes of different Southeast Asian cultures are suspiciously similar in look and taste. This certainly is true of beef noodle soup. The Vietnamese "pho" is not much different from the Thai "kuay tiow reua, " or the Cantonese beef noodles you get in Chinatown noodle shops. The favorite noodles served in beef soup is fresh rice noodles - the same kind used for Chinese "chow fun." Available in most Asian markets, they come in dense two-pound packages. Be sure to separate the noodles into individual strands before using, or else you will have one big lump in your soup. Finally, each partaker at a noodle meal can spice the soup any way he or she wishes with chile sauces, fish sauce and other condiments laid out on the table. Bottled sauces, such as Chinese chile sauce with garlic or Sriracha hot sauce, are available from most Asian stores. I prefer to make my own with fresh chiles as in the recipe above. 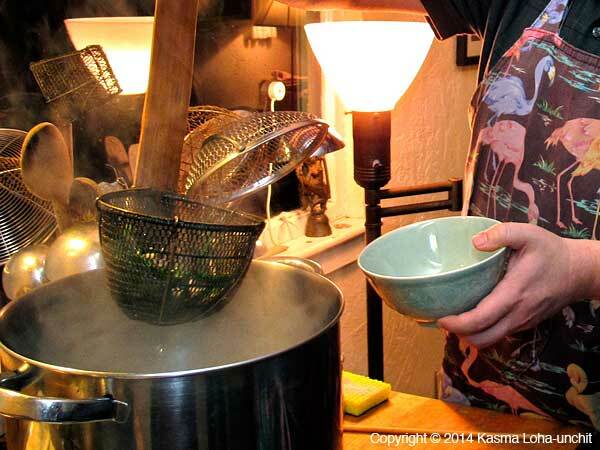 Kasma teaches this recipe in the Evening Series Advanced Set C-1. *Because the Thai language has its own script, there are different ways of transliterating Thai into English. The more phonetic version is Gkuay Dtiow Reua; the more usual spelling is Kuay Tiow Reua. See A Note on Thai Pronunciation and Spelling.